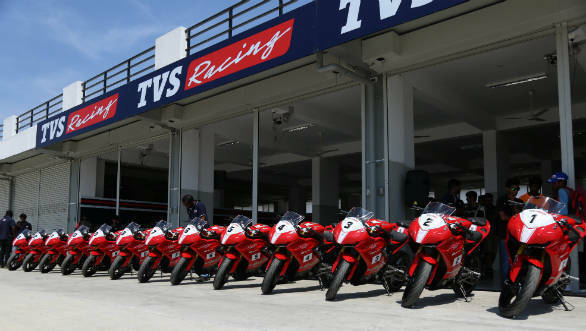 TVS Motor Company's factory arm TVS Racing has announced the list of participants for its TVS Apache RR 310 one-make racing series. These 12 riders will compete in the first edition of this race series, which is being conducted in June 2018 as part of the Indian National Motorcycle Racing Championship (INMRC). 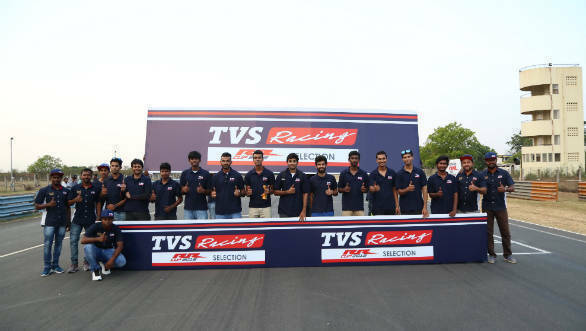 The final riders chosen were selected from 40 shortlisted entries out of the 287 initial entrants for the selection round held at the Madras Motor Race Track (MMRT) in Chennai. They were chosen based on their fastest lap times but all entrants had to have at least a podium finish podium finish in INMRC or any one-make championship. The RR310 race series will use a specially prepared race version of TVS' RR 310 motorcycle. Notable improvements are a free-flow exhaust, improved induction system, race tuned ECU and modified foot- pegs to provide race-specific ergonomics. This one-make series will consist of six rounds which will be held at Chennai, Coimbatore and Budh International Circuit (Noida). One of these rounds will also be a part of the Asian championship. TVS says this motorsport event has been developed to support and nurture young talent in motorsport across the country and also to highlight the pedigree of its motorsport arm and help develop the race-spec Apache RR310.